Today's episode is with Liz Wilcox, from The Virtual Campground. Liz created The Virtual Campground as a place for like-minded spirits to come explore and find joy in all that is RVing. I've been following Liz for what feels like forever, even though I have NO interest at all in RVing. I just love her and how she approaches the challenges within the blogging world. There's a lot you can learn from someone like her! You'll laugh a ton, you'll learn a ton, and your mindset about creating digital products and getting stuff done will (hopefully) start to shift. This is an inspiring episode of Rebel Boss Ladies! Oh, and yes this is EPISODE 1 of my new podcast! This has been a goal of mine for quite some time now so I'm PUMPED OUT OF MY MIND that I bit the bullet and hit publish on this first episode. Got any ideas or recommendations for future episodes? Do you have a suggestion for an amazing REBEL BOSS LADY who absolutely MUST be on the show because she's doing crazy awesome work online to build a life of freedom for herself and her family? I'd also love it if you considered SHARING this. I did something super scary by hitting the publish button on this episode, so if you like it and feel that I should continue hitting publish even though it makes my stomach twist and turn in weird scary ways, show me some love by sharing this with the world! Your support means the world to me in ways I can't even begin to put to words. Thank you. Alright, enough talk. Let's get to the show! I love Liz because she is unapologetically herself in all her amazing craziness. She knows exactly who she is and she is NOT afraid to share it with the world. And guess what? That's exactly the reason why Liz's audience has blossomed in the past two years. You don't have to speak a certain way, look a certain way in order to appeal to an audience. Just be you 100% and the right people will find you and stick around. Liz knew from the very beginning that she wanted to create a product to monetize her site. So six months into her journey, she got to work brainstorming some ideas for things she could create for her audience. The idea for Liz's book, Tales from the Black Tank: A Collection of Hilariously Crappy Stories, actually surfaced from a variety of different things – her personal life experiences her audience's feedback. 3. You can create and sell a product without spending a ton of time or money! Liz's ebook took six full weeks to write, and that was with really crappy wifi. We estimate that Liz could have cut that workload and timeline in HALF if she had a strong internet. She also only spent $15 creating her ebook. So $15 dollars and six weeks later, Liz had an ebook created that she could market and sell to her audience. That tiny investment led to a ton of new opportunities. 4. Who cares if you don't know how to “launch”? Liz had no idea what launching was when she created and “launched” her book. On a recommendations from a friend, Liz purchased this book to get some launching tips, got to reading, and started implementing some of what she learned. Talk about “go with the flow,” am I right? Not knowing how to quote on quote LAUNCH is no excuse! 5. Small email lists are still lucrative – ask Liz! With only 300 people on her email list, Liz pre-sold 8 copies of her ebook before she even wrote it. Liz says, “I told them it was a $20 book and they were going to get it for $10.” Bam. Right there, Liz earned $80 from an ebook that she hadn't even created yet. Despite there not being a ton of searches in Google for Liz's particular niche, she still went for it anyway and staked her claim. Creating this ebook, helped Liz find the right people to share her message. Liz found a gap in the market and targeted a group of people that most other bloggers weren't targeting. This helped repel the wrong audience and attract the right audience. You'll learn more than you think you can from creating and launching a book. And making money from something that YOU created feels absolutely incredible and will inspire you to keep putting in the work to grow. Liz didn't have a huge audience to launch to, but what she did have was a network of influencers who had a wider reach than her. So when Liz posted on Facebook about her ebook, those people that she built relationships with started to share the book with their audience. Liz's network ultimately helped her TRIPLE her sales. Moral of the story: having a small audience doesn't mean you can't GROW. Leverage your network! After Liz launched her book, she received an email from an international company that asked to use her ebook as a lead magnet on their site. Liz would be paid $7 per download. This resulted in Liz earning another couple thousand dollars and helped grow her relationship with this company. 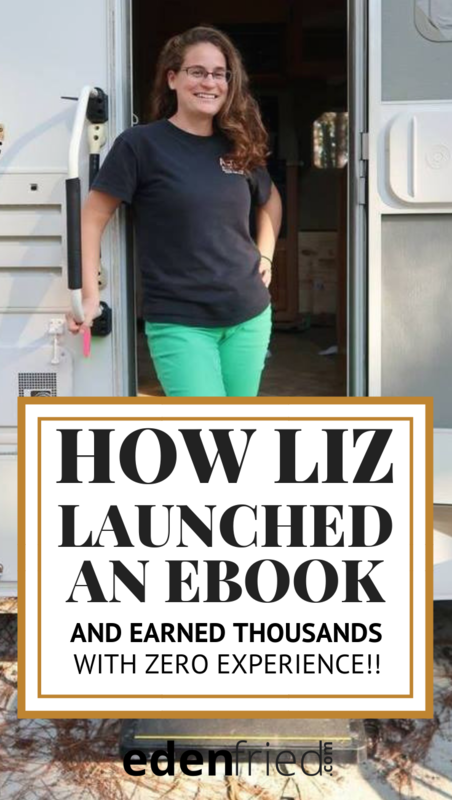 Liz's book also opened the door to business coaching opportunities with current RVers who wanted to learn how to monetize THEIR sites, as well. See how this silly little book about “crappy stories” helped change Liz's world?